September is Sepsis Awareness Month and Wednesday 13th September is this year’s World Sepsis Day. My family has been touched by sepsis a number of times. We know too well how serious sepsis is. 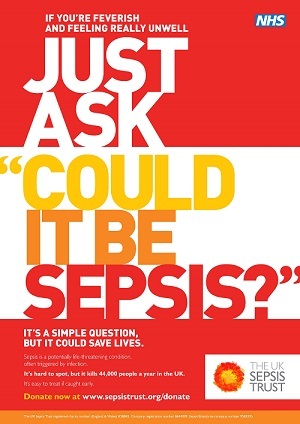 There’s an estimated 150,000 cases of sepsis in the UK each year, and around 44,000 deaths. Myself and my relative should be part of that 44,000, but we are fortunate to have survived. I have survived more unscathed than my relative. However, I have pre-existing conditions that predispose me to having sepsis, which means I am more likely to suffer sepsis repeatedly, as I already have. 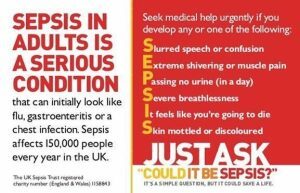 What is sepsis? Sepsis is a life-threatening condition that arises when the body’s response to infection causes injury to its own tissues and organs. Despite common misconceptions, sepsis is not the infection itself. Your immune system protects you from many illnesses and infections, but it’s also possible for it to go into overdrive in response to an infection, which is what occurs in sepsis. Common signs and symptoms include fever, increased heart rate, increased breathing rate and confusion. Severe sepsis is sepsis causing poor organ function or insufficient blood flow. Insufficient blood flow may be evident by low blood pressure, high blood lactate, or low urine output. Very severe cases of sepsis can lead to septic shock, which is a medical emergency. Septic shock is low blood pressure due to sepsis that does not improve after reasonable amounts of intravenous fluids are given. 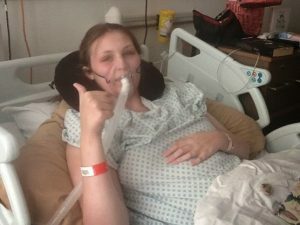 I’m 23 years old and a 12 times sepsis survivor. 12 times, I could’ve been part of the 44,000 who don’t make it. To survive once is great, twice is lucky, to survive three times unusual. To survive 12 times? I don’t even know what to call that. However I can say with certainty, it isn’t luck that’s enabled me to survive a dozen times, it’s good care. Admittedly, my care hasn’t always been perfect, even in the throws of sepsis, but thanks to the expertise of my fantastic specialist teams I have had the care I require to survive and they have meant that I have successfully overcome sepsis 12 times. Why have I had sepsis so many times? I’ve had sepsis from various underlying infections. I have a number of complex, life-limiting conditions that mean I have multi-organ failure and a lot of intervention is required to keep me alive, as well as an immune system that doesn’t always recognise or fight infection. I have a permanent central line known as a Hickman Line, which gives constant intravenous access directly into my heart. My nutrition, TPN, is administered through this line over 21 hours a day, and I also receive intravenous fluids and intravenous medications every day. I simply wouldn’t survive without permanent intravenous access, nor the intravenous feeding, fluid and medication I receive each day. However, this line and the high glucose content in my feeds, mean I am prone to infections in the line which can then spread into my bloodstream, overwhelming my body and causing sepsis. This has happened four times, where an infection has settled in my line, spread into my bloodstream and my bodily reaction has escalated to sepsis. These infections have caused me to lose lines, on which my survival depends. 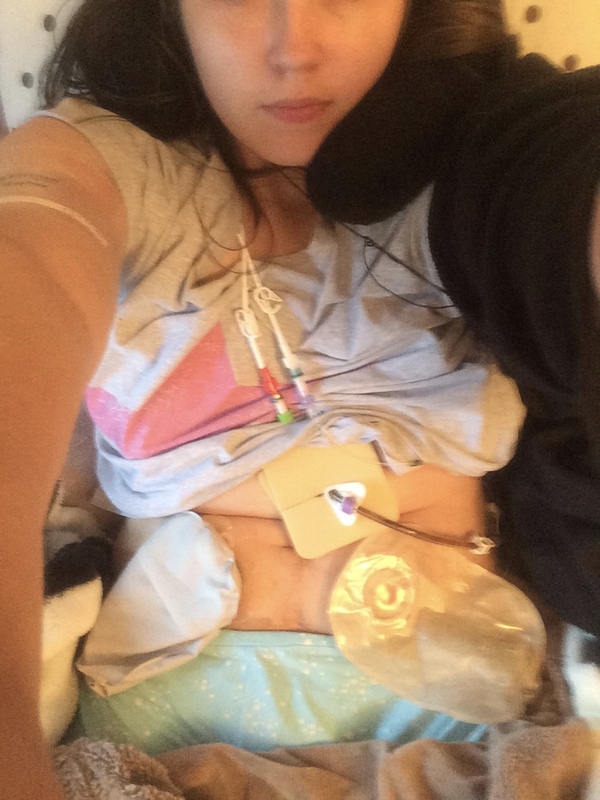 I have also had sepsis resulting from an operation, occurring after the surgery to form my Urostomy (Ileal Conduit), where a piece of bowel is cut free and used to form a ‘tube’ for the urine to drain from my kidneys, through the ureters, into this section of bowel and then out onto a bag stuck to my abdomen. My gut harbours much bad bacteria due to Chronic Intestinal Pseudo Obstruction (CIPO) causing Small Intestine Bacterial Overgrowth (SIBO), where bad bacteria overpopulates in the bowel. Due to CIPO, my gut has dilated and stretched so much and the bowel wall become so thin and fragile and this allows this ‘bad’ bacteria to leak through the bowel wall and into my bloodstream. There, it settles in my Hickman Line or other points in my body, known as translocation. 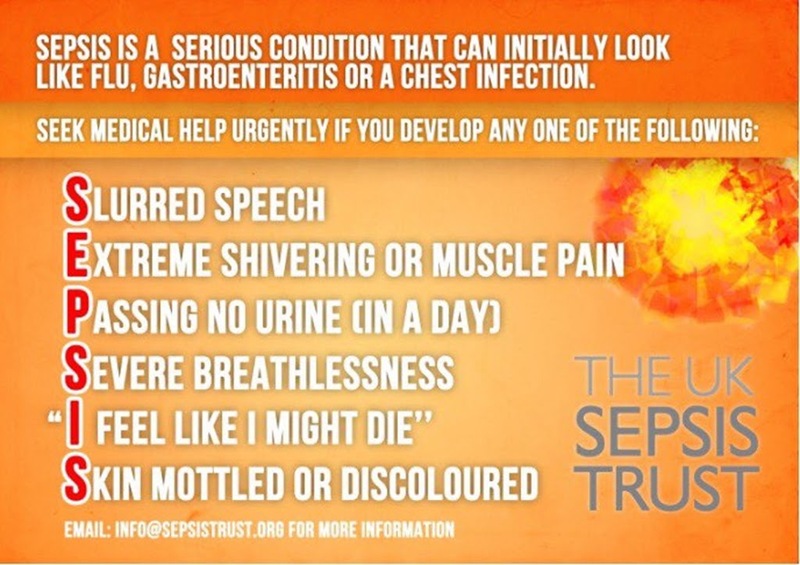 The third cause of my sepsis battles, seven of them in total, is my kidneys, known as urosepsis. I have a permanent infection in my kidneys, E.coli, which was caused by gut bug translocation initially and is now unable to be cured or even treated unless the infection threatens my life. You see, I have had so many different antibiotics for the E.coli in my kidneys that have failed to treat it, that it is now almost completely resistant. We have two intravenous antibiotics that we can use, in life-threatening episodes, to calm the infection down, but they do not cure it. Therefore, we have to save them for life-threatening situations. It means I live with symptoms from the kidney infection and the infection is slowly damaging my kidneys, but it has not caused urosepsis since March 2016 – a record for me. Aside from my aforementioned battles with sepsis, I live with four permanent, incurable infections, all of which could cause sepsis at any time. I do have some lasting impacts from sepsis, but fortunately these are relatively mild. These after-effects, which may be referred to as “post-sepsis syndrome”, which for me are mild compared to the after-effects some suffer, are nonetheless troubling. Sepsis has weakened my already weak body. Each battle with sepsis has left its mark, serving to speed up deterioration and increase the impact of symptoms I already suffer as a result of my conditions and their complications. I have suffered an increase in fatigue, aches and pains, increased weakness and an increase in the symptoms of the Autonomic Neuropathy I already suffer with. Each sepsis bout would leave me more tired, weaker and with increased cognitive decline, albeit mild. I often have described the latter as “I feel as if I’m becoming stupid.” I have a brilliant brain and am not afraid to say I’m very intelligent, but each bout with sepsis would serve to batter my short-term memory, increase the ‘brain fog’ that sometimes plagues me and make things like word recall and remembering names harder; but my long term memory has remained unscathed. Another, somewhat strange effect of sepsis was the sudden onset of pain in my right hip around the metalwork following sepsis in March 2016. I fell out of bed in hospital in July 2014 and broke my hip, necessitating a dynamic hip screw and a plate. Once I recovered from the post-surgical pain, I had little complaints about the metalwork and no pain in my hip. Then, less than 2 years later, I suffered yet another bout of sepsis, which resulted in pain around the metalwork that has never really left. Initially panic ensued that I had developed an infection around the metalwork in my hip, but apart from noticing arthritic changes in the joint and poor healing around the metalwork, there was no reason for my sudden increase in pain – the trigger was the bout of sepsis. However, I’d had multiple bouts of sepsis between the fall that necessitated the operation to insert the metalwork into my right hip, and the onset of pain in that hip in 2016, so why the sepsis in 2016 triggered the pain where the previous bouts hadn’t, no one knows. The biggest post-sepsis problem for me is with my immune system. My immune system has become very poor at recognising infections, allowing them to escalate quickly without any attempt from my immune system to fight it. I get seriously ill from the infection running rampant in my body, which suddenly triggers my immune system which jumps into overdrive, causing sepsis and related symptoms and organ dysfunction. It makes it very dangerous for me; I get no early warning signs of an infection, then suddenly I’ll become very poorly in a matter of an hour or two. I’ll be taken to hospital, at this point I’ve almost always developed sepsis, and it becomes a battle to stabilise me. Isolating the source of infection can be hard, when you already have infections in many places, and given all my interventions I have a lot of places for infections to ‘hide out’. My immune system doesn’t recognise them in the early stages, then when the infection takes hold suddenly my immune system jumps into action but goes overboard and causes sepsis. This immune system dysfunction is almost certainly the result of all the infections I’ve had, the fact I have four incurable infections living in my body and all twelve battles with sepsis. Post-sepsis syndrome is little understood, rarely talked about and to be honest, very few people know about it. Whilst my post-sepsis syndrome may be mild compared to the effects others suffer, it is nonetheless troubling. I already have a life-limiting, degenerative condition, and sepsis just accelerates the decline. It attacks a body that doesn’t have the reserves in the first place. Despite the post-sepsis effects, I know how fortunate I am that, in each sepsis battle, most of the sepsis-related organ damage and derangement has been reversed by timely treatment including intravenous antibiotics, intravenous fluid and intravenous Paracetamol, sometimes needing vasopressors and sometimes oxygen. I have to live with post-sepsis symptoms and problems, but at least I’m alive. To overcome sepsis twelve times, especially when you already have a weak and struggling body, is nothing short of a miracle. However, I owe my survival to the care of my teams who have ensured that I have got through each infection and each battle with sepsis and can continue on with living my life, which I am so grateful for. Timely and appropriate treatment has meant I’m still here today. In addition to my battles with sepsis, there is another member of my family whose life has been affected by sepsis; more specifically septicaemia. This family member of mine was 16 when she contracted meningitis and resultant meningococcal septicaemia (often called “blood poisoning”). She was in a coma for a while and had to have both legs amputated below the knee. The septicaemia also caused kidney failure, meaning she went home a double amputee on dialysis at the age of 17. She then had a kidney transplant on Christmas Day 2003. It has not stopped her, however. She is a qualified nurse, emigrated to New Zealand with her husband and is now a very proud (and busy) mum. She’s the most determined person I know and serves as an inspiration to me through my own struggles. In her case, the septicaemia affected blood flow and damaged tissues in her body, which caused the sequelae from the sepsis: the severe disease and gangrene in her lower legs and thus the requirement for her limbs to be amputated below the knee and damage to some other tissues as well as the irreparable damage to her kidneys, causing the need for dialysis and then her kidney transplant. She was also in a coma for a long time as a result. She’s lucky to be alive. 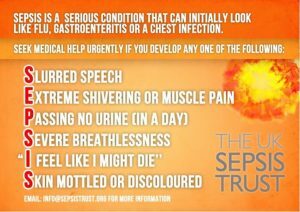 I hope people will become more aware of the signs and symptoms of sepsis. 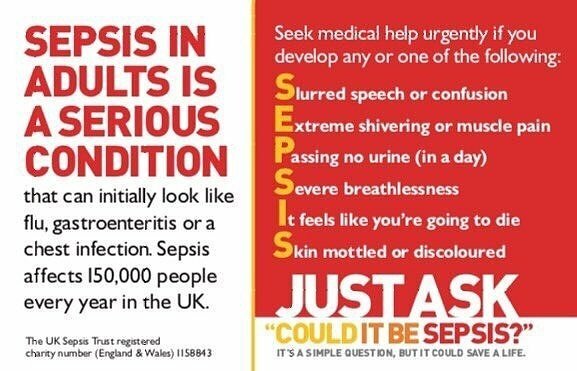 People need to “think sepsis”. It’s important to recognise the signs. 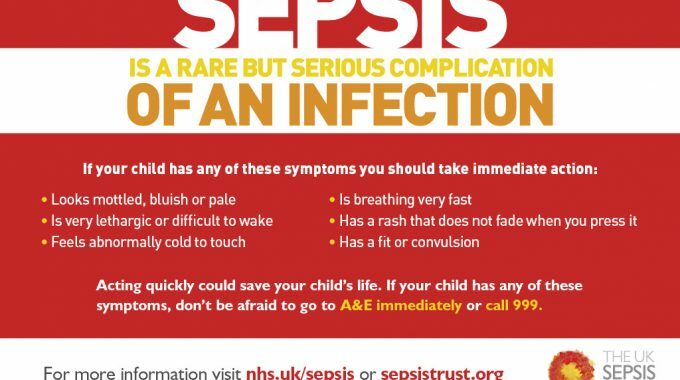 To the unaware, they may miss the signs, especially as the early symptoms of sepsis can be indistinguishable from the symptoms of the original infection itself. 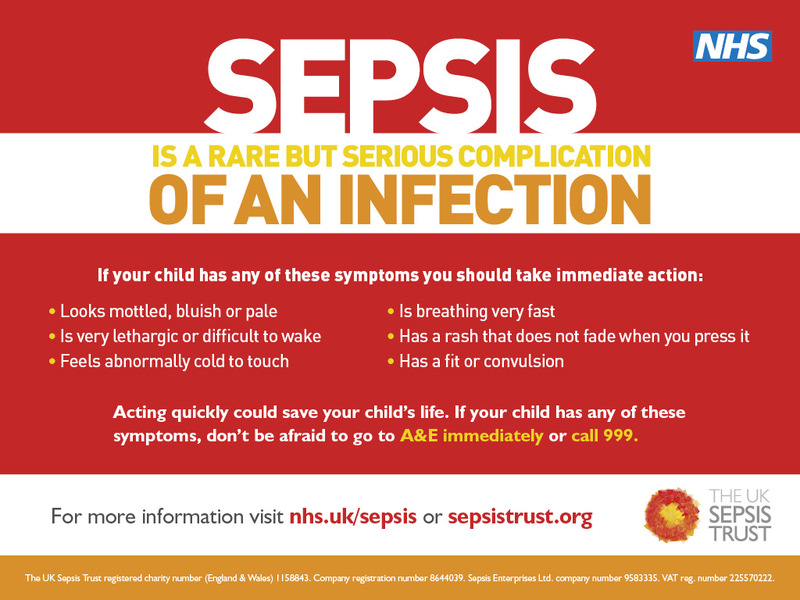 It’s important to recognise when the symptoms continue to deteriorate and other suspicious symptoms occur that may indicate sepsis. These symptoms include a high temperature, especially if it isn’t responding to Paracetamol; elevated heart rate (normal resting heart rate is 60-90 beats per minute); elevated respiratory rate (fast breathing); chills and severe shivering (rigours); reduced (or absent) urine output; confusion and may include other symptoms including vomiting, light and noise sensitivity and severe pain, as well as an often reported feeling of “I’m dying” or an impending sense of doom. Children may have similar symptoms but they have a lower threshold. Sepsis kills. Know the signs. 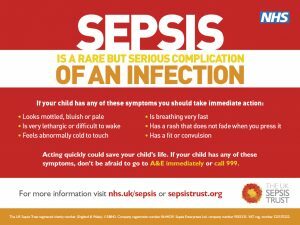 Please spread the word this Sepsis Awareness Month and World Sepsis Day. For more information, head over to the UK Sepsis Trust website (currently being updated but do check back at a later date). 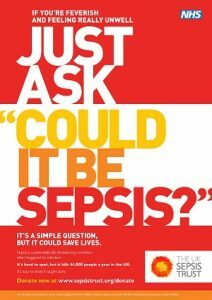 Thank you to Dr Ron Daniels BEM, founder and CEO of UK Sepsis Trust, for allowing me to use their images in this blog. This is horrible! I've read a lot at Portside language services, cause my English is not very well, but I can tell that this illness is not so comfortable.